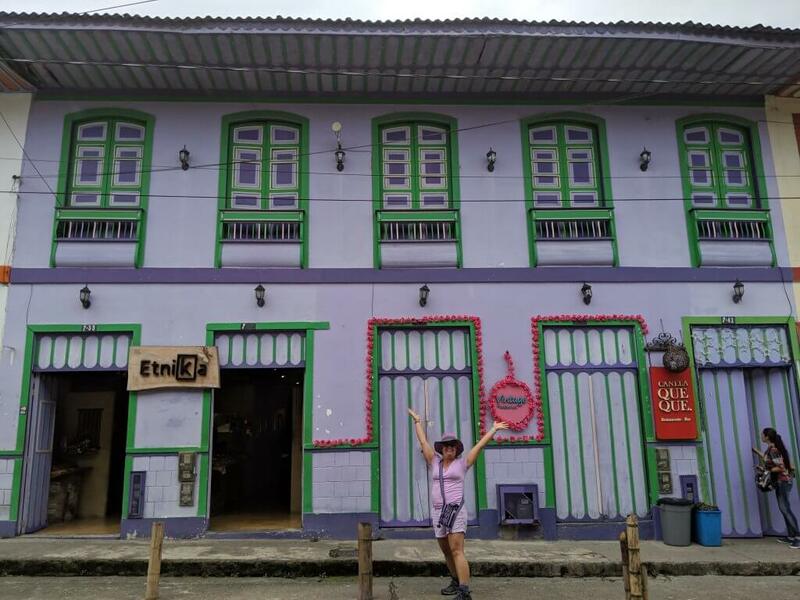 Living a Month in Medellin - Come adventure with me. “Pachamama” says hello from Comuna 13. Arriving to Medellin after a month in Santiago, Chile, felt like heaven. Green, lush neighborhoods on tops of giant hills with fantastic views held my spirit that had sought escape from 5 weeks in bland Santiago. Top the new chi with good food and a great workspace beat, Medellin immediately jumped up my hopes that it’d be a great place to stay for a month. My walk to work passed jungles and streams. In this Renaissance city, where the people’s vibe and energy are quickly replacing its horrible narcotic past, I felt the immediate synergy of a city with a mission. Its new subway with climbing gondolas took me to transitioning neighborhoods in valleys and on tops of impressive hills. Vistas filled with jungled mountainsides, red roof-topped barrios and paragliding enthusiasts invited adventures up and down the city. 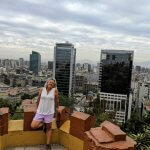 Top off the vibrant atmosphere with delicious foods, fruits, and fun experiences, and I will remember Medellin as a great city to enjoy by foot and through food. And do I mean hills. Lots of them. My daily walk to my workout at a mile away climbed over 1500 feet. A typical 20-minute mile on the flat lands became a 30-minute trudge up steep climbs and steeper staircases. In March, there’s as much rain in Medellin as steps up hills. As the month progressed, the rain increased, ultimately raining for days on end with only small oases of party sunny bursts of sunshine. But despite the hills and the rain, or maybe because of them, I’ll remember Medellin as vibrant and tasty. At the end of the walking tour, you’ll be inspired by this sculpture. The month started with a walking tour of Medellin. Whereas I almost always recommend the local free walking tour in any city, the one for Medellin is especially important. Medellin’s history roots in the stories of Pablo Escobar. Depending on how your tour treats him and his legacy will set up your attitude about his history. Escobar is a sensitive subject and divisive. I chose this walking tour because it treats “PE” as a villain, who despite building homes and infrastructure, still killed many innocent people. 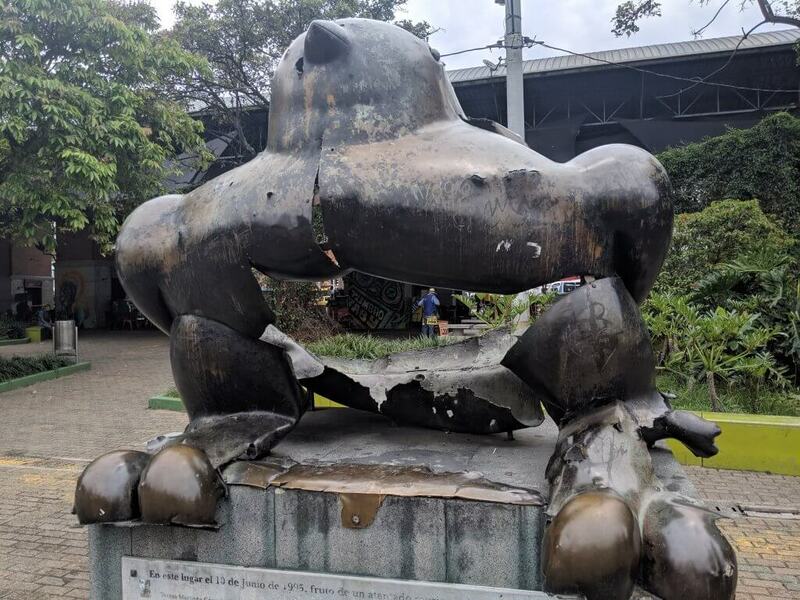 Regardless of which tour you pick, you’ll discover that PE’s trauma still echos in current voices and sets the stage for many events and experiences you’ll have in Medellin. Botero Square is filled with Boteros! My walking tour started out with a long verbal history of PE, took us through some of the most dynamic areas of El Centro including the Alpujarra administrative center, Parque de Luz, the Palacio Nacional, Veracruz Church, the Botero Square and ending up at the dramatic San Antonio Park. 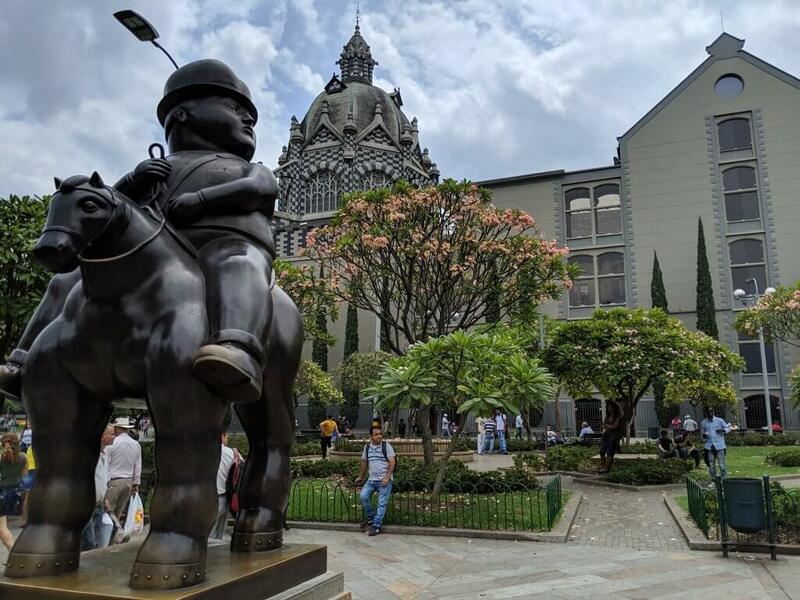 At San Antonio, where we saw the story of peace through Botero’s bird sculptures, I was reminded that good can arise in the most obscure places, and despite difficult circumstances, it always wins–a theme that prevailed throughout Medellin. Once I had the lay off the land, I ventured off into world of food. 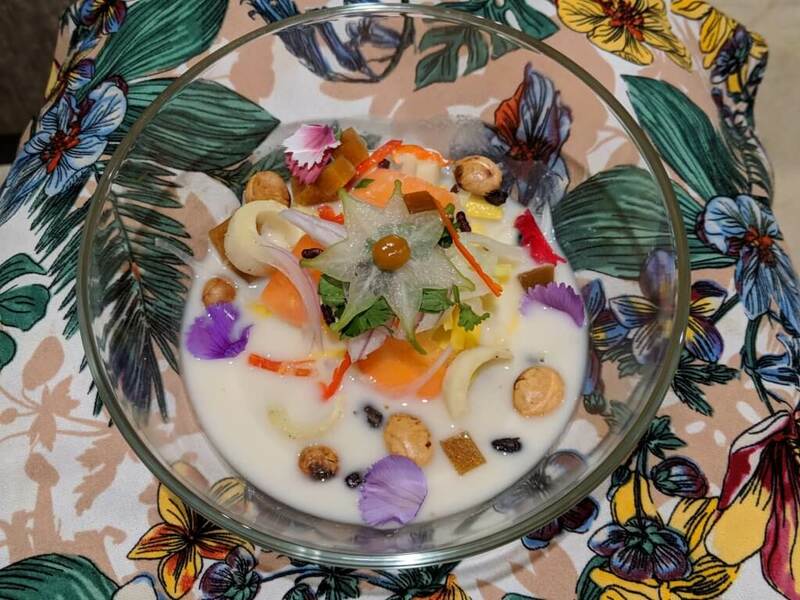 Colombia’s food scene vibrates through the richness of its fruit scene. 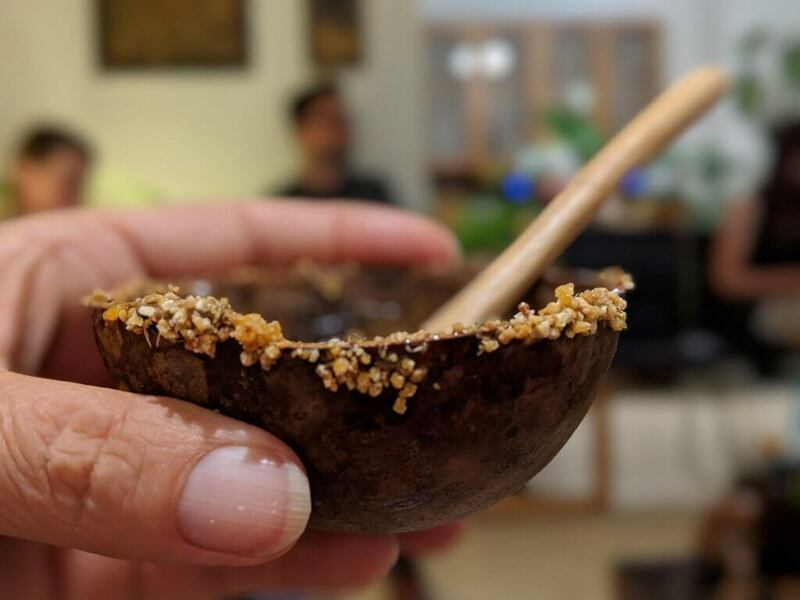 I got invited to the home of an amazing food entrepreneur who wants to bring the traditional flavors of Colombia and its jungle back to the local people’s palates. Lucas, owner of Intuitive Cuisine, treated us to a night of local tastes. Fruit ceviche tasted exactly like the real stuff, but better. We started with a drink bar of hibiscus teas and then progressed through a menu of coca-dusted popcorn, yucca-flake encrusted chontadoro soup in a tutumo squash bowl, a fruit ceviche soup made from jungle fruits and seeds yet tasted exactly like a fish-based ceviche, a pirarucu fish broiled and set upon a cassava puree, and we finished with an almond cheese plate sided with acai plantain popsicles. 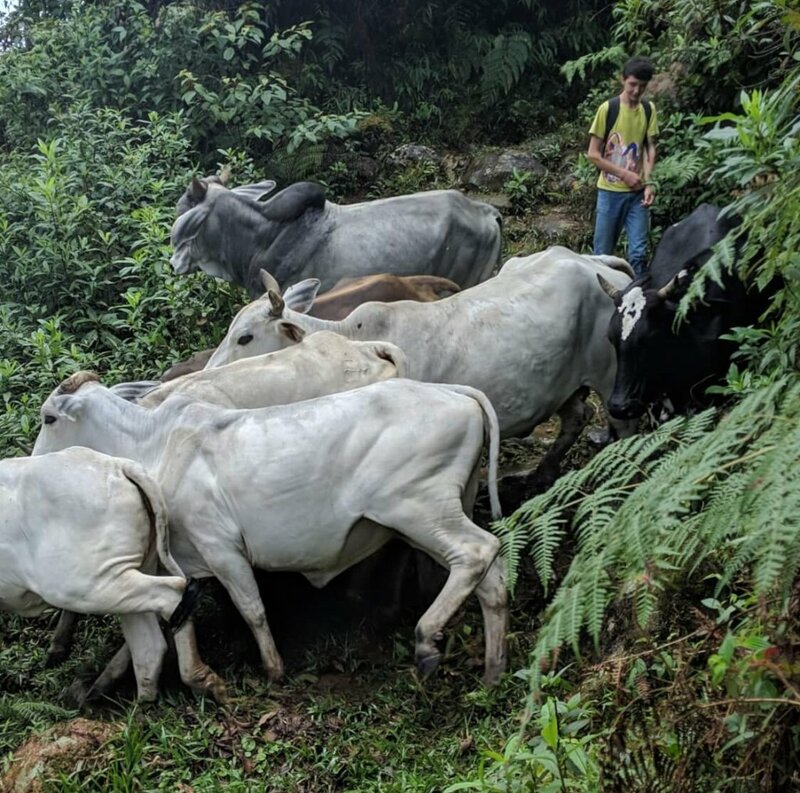 In between meals, Lucas told the story of Colombia’s disconnection from the land and his attempts to reconnect these Paisas. Through these connections, he believes, Colombia will heal. Book a night with him. How about some tree tomato? 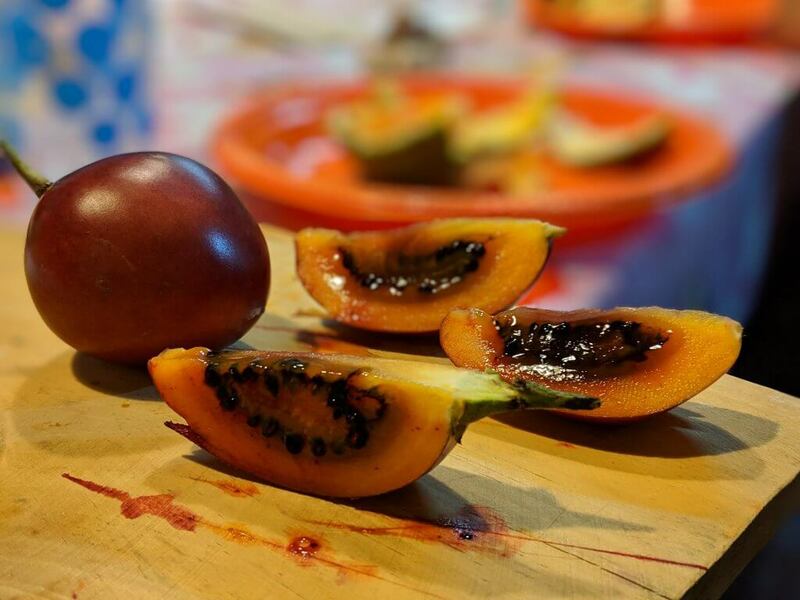 Following along from that night, I had another invite to a home to try an array of Colombia’s best fruits. Did you know there are four different types of passion fruits, a tree tomato, and several types of oranges, including mandarin, that grow in Colombia? Attending this class opened up my palate to go crazy in the local fruit market and just buy, buy, buy and taste, taste, taste. From sour tastes that swallow sweet to fruits that taste like ice cream, I couldn’t get enough of the fresh fruits and drinks readily available everywhere. Although my friend does not do public parties, you can find several fruit tours in Medellin. 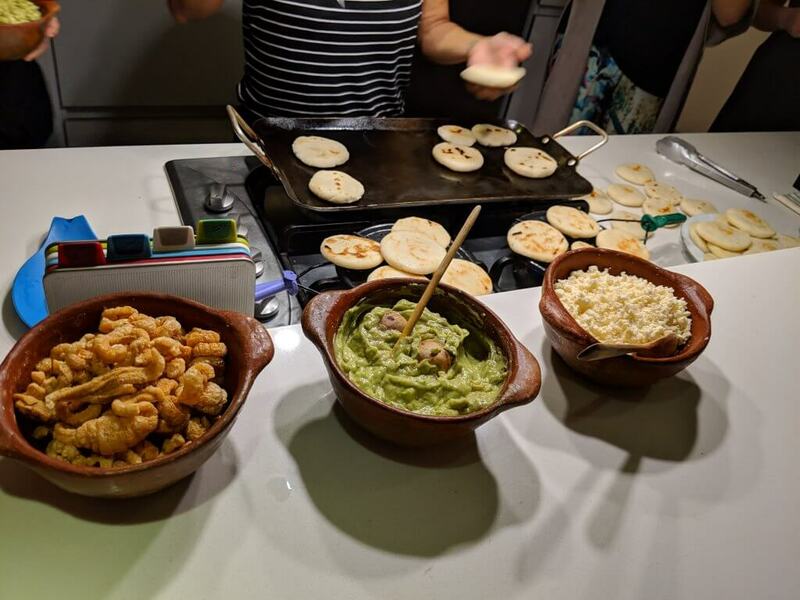 In addition to the exotic fruit tastes, we also got the chance to learn how to make arepas and patacones. Arepas, the bread of both Colombia and Venezuela, are bland corn disks that subtly decorate the sides of all Colombian dinners. But it’s what you put on top of them that make them come alive–guacamole, salsa, queso, and a thousand other toppings from chorizo to pulled pollo. Easy to make and durable, don’t forget to try them! One of my favorite snacks in Latin America, patacones. 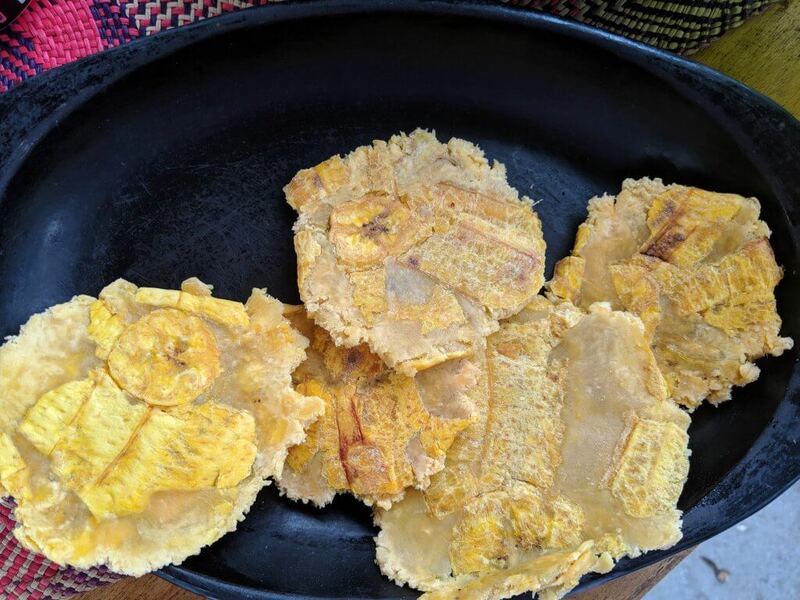 Patacones, on the other hand, are either green or brown plantain bananas mushed into disks, too. These flavorful accompaniments sit on the opposite side of the plate and beg for simple salt, salsa or frijoles. We learned to make these at Hacienda Venicia (see below) while taking a break from our coffee tasting. 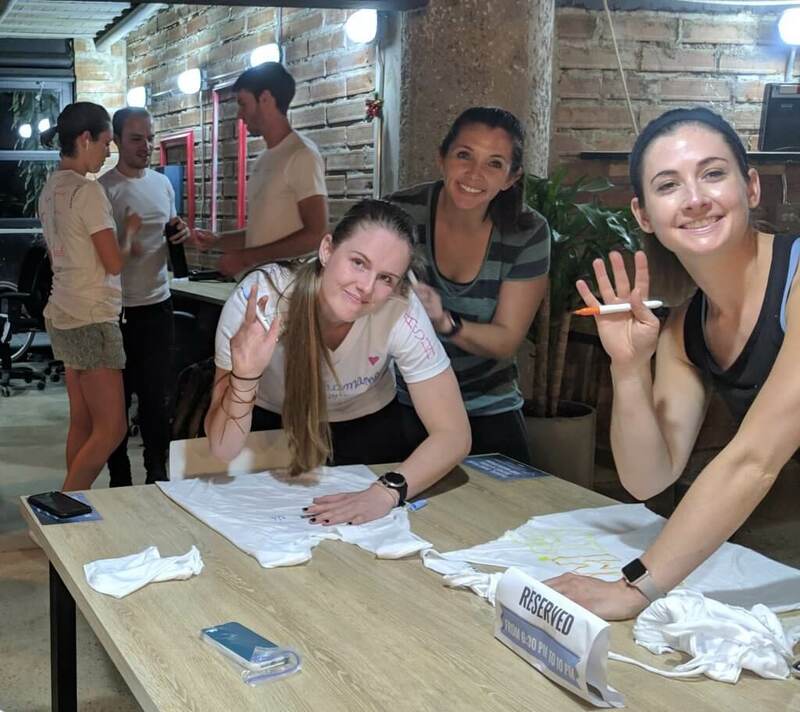 We created t-shirts for a fun run to raise money across the globe! Like many other Latin America cities, Medellin also has a “ciclovia” where it sets aside its streets on the weekend for people to enjoy outdoor recreation. For us, they happened to be opening the streets up on a special Thursday night, which was the same night of the annual Remote Year Run the Nation fundraiser. All throughout the Remote Year locations, each group ran or walked for two hours. Total distances were calculated, handing out bragging rights to the winners. 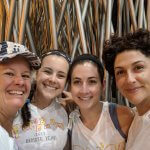 Remote Year then made donations to several locations to support ongoing Positive Impact events being held by each team. These events are some of my favorite days on Remote Year. As with other months on my Remote Year adventure, the local team organizes an event for all of us to participate. This month’s event had us journeying in a van, where the journey was part of the experience, to a bridge to jump from and a mountain to climb up. 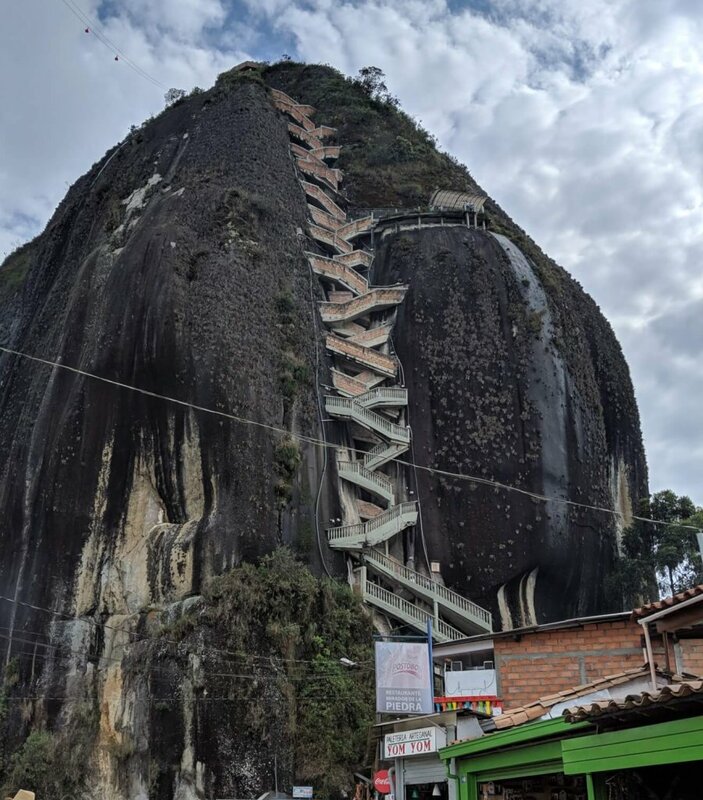 Seven-hundred and seventy steps took up to the top off El Peñol, a must-do destination if not for the views, but for the stop off in the charming Guatapé. Be sure to grab a cheese-encrusted, melty, gooey arepa for a mere $1 from any of the local ladies grilling in the street. Mobile boot washer keeping busy at the local market. On the way to Guatapé, we passed through a small community having its weekly market. 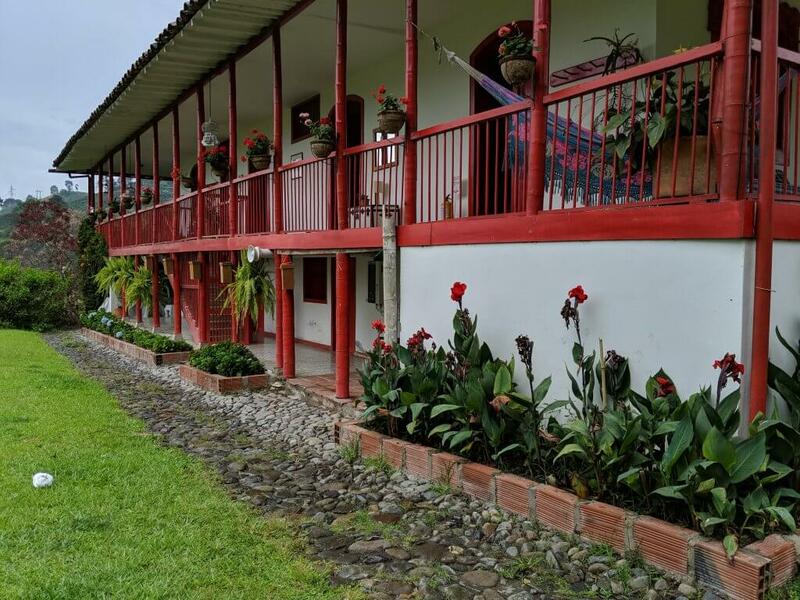 Getting just a few miles outside of Medellin brings you quickly to the humble agricultural communities that support the vibrant cities and their food supplies. In these communities, horses remain the frequent mode of transportation. I loved seeing the ladies doing the humble task of washing the farmers’ boots for a fee. 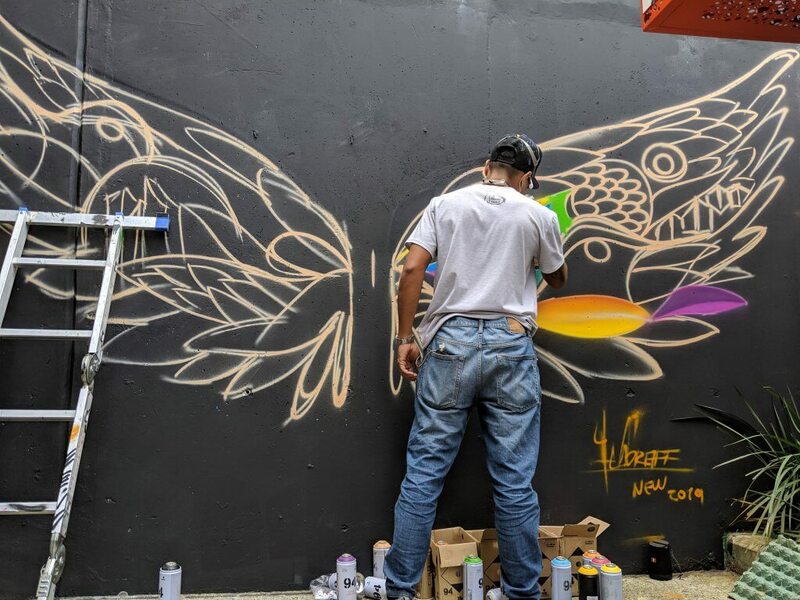 Comuna 13 holds the future of dreams in beautiful art. Visiting Medellin isn’t complete until you do a walking tour of Comuna 13. Home to Escobar’s gang of drugged thieves, the neighborhood became invested with the ills of mankind. But the women of the sons, brothers, and fathers who were trapped in a coke-filled life said, “Enough!” Together with the force of the Colombia military, they forced out the nastiness. In its place is the birth of Medellin’s renaissance. 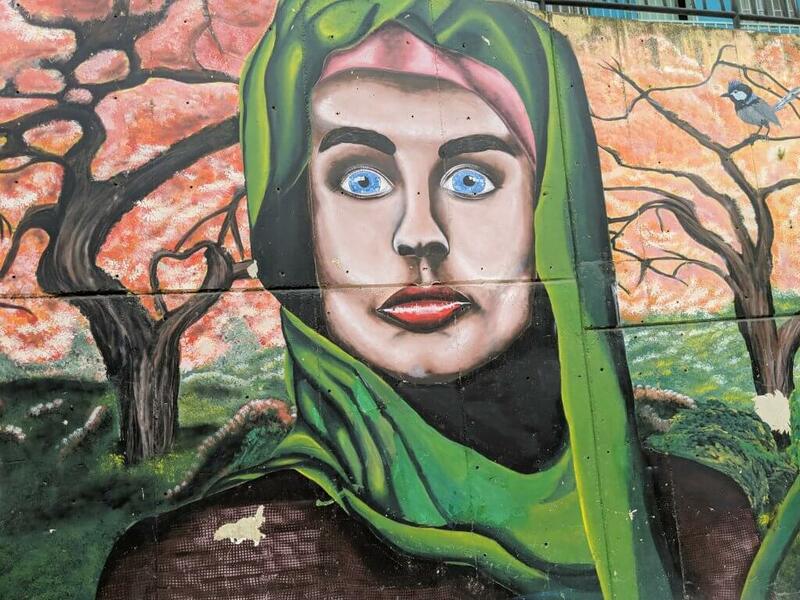 Comuna 13 now thrives an artistic beat of tourism and rap where artists tell an upbeat tale of Pachamama returning to a place that frightened her out. Like the walking tour of the city, you’ll want to also be choosy about which guide you hire for Comuna 13. And yes, you need a guide. Doing Comuna 13 without a guide would be like eating a sundae without whipped cream and hot sauce. I used Manual from VITTours. 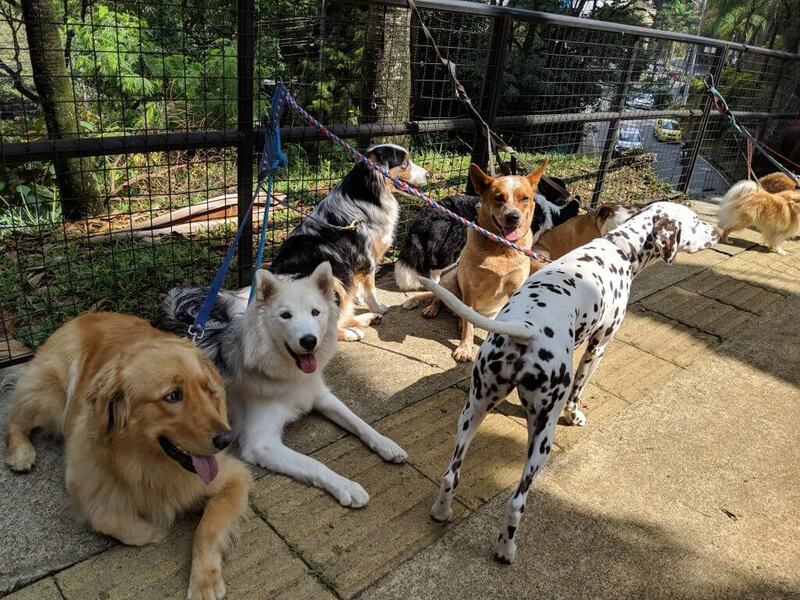 Dogs awaiting their walker in Medellin. 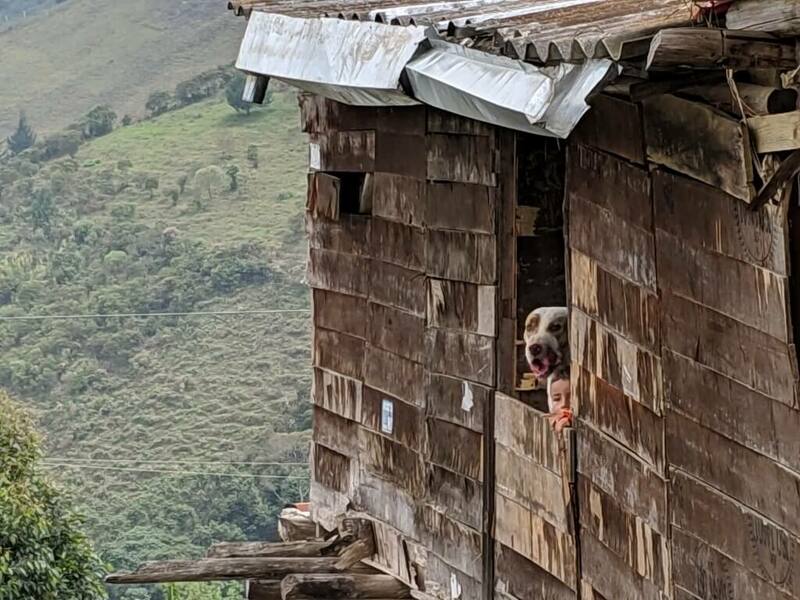 A quick note about the dogs in Medellin. Whereas Santiago had stray dogs a plenty, which in general were pretty sweet and somewhat healthy, Medellin’s dogs live the lap of dog luxury. Strays were far and few in between, but professional dog walkers graced every street. I frequently passed walkers with five dogs or more moving their pawed friends through Medellin’s many parks and shaded streets. Beyond Santo Domingo in the land of the displaced. After exploring the Poblado neighborhood by foot where I found just one too many Gringos, I accepted the adventure of journeying through a neighborhood most people cruise over in gondolas on their way to Parque Arvi. 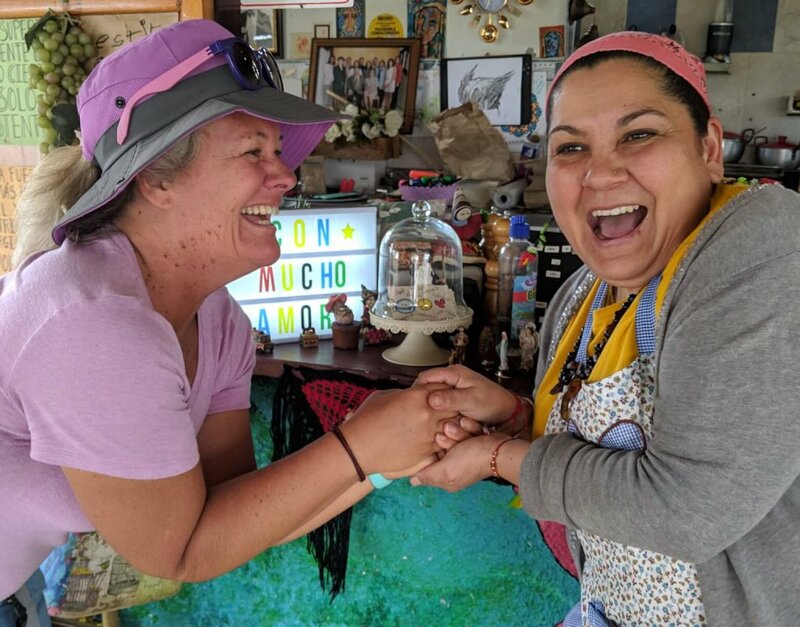 With an intrepid group of hiking volunteers, we hiked up through the Santo Domingo neighborhood where some locals joined us to share a peak into their transitional life. This neighborhood above Santo Domingo homes the displaced–Colombians who have fled their homes due to the drug wars. 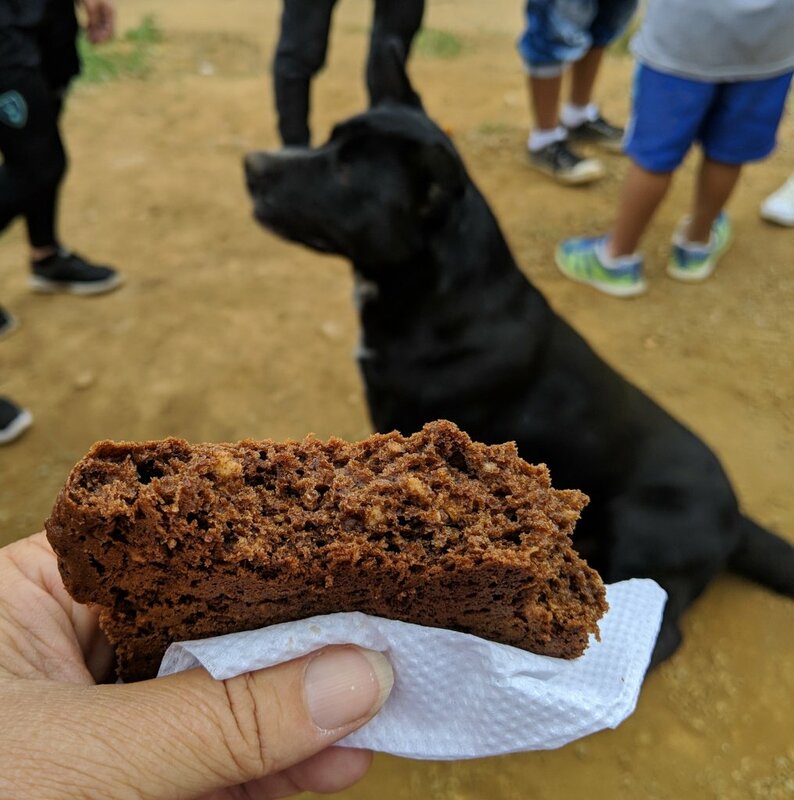 A chocolate bran muffin top delighted the hikers. 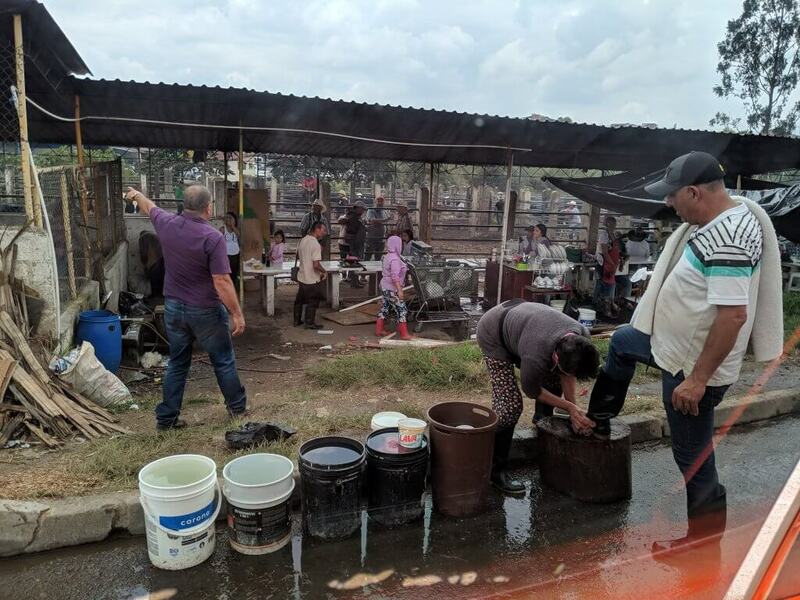 In a no man’s land that is outside of the city/county of Medellin where infrastructure disappears and hopes hang on, we met several small business who received funds from our hiking partner to incubate their futures via panderias and dulcerias. Be sure to eat at the vegetarian cafe on top of Parque Arvi. This heartbreaking yet inspiring walk ended on top of Parque Arvi in a vegetarian restaurant filled with love where Medellin’s Hope Conquers All message continued. The Venecia Hacienda is a place where I will return. Colombia is famous for its coffee. I don’t know, as I don’t drink it, but I was intrigued to visit a coffee plantation to learn the ins and out of coffee making. It was one of the most relaxing weekends of my life. I visited the Hacienda Venecia, one of the largest independent growers and roasters in the Pereira region. I couldn’t get over the amazing, century-old, family home-turned hotel, its unbelievable attention to space-making details, and the incredible views through the valley. Of course the accompanied coffee tour was fantastic, including a chance to pick beans, to follow the sorting and drying process and finally to taste a cup of roasted deliciousness. Finlandia loves its purple, as do I! But from the Hacienda, we took a few side trips I’ll remember even more than the coffee experience. I became infatuated with the quaint Finlandia where homes in purples and oranges brightened the already smiling faces of the locals. I liked Finlanda more than the touristy Salento where I had to buy a brightly woven Colombia purse. The wax palms are the tallest in the world here. 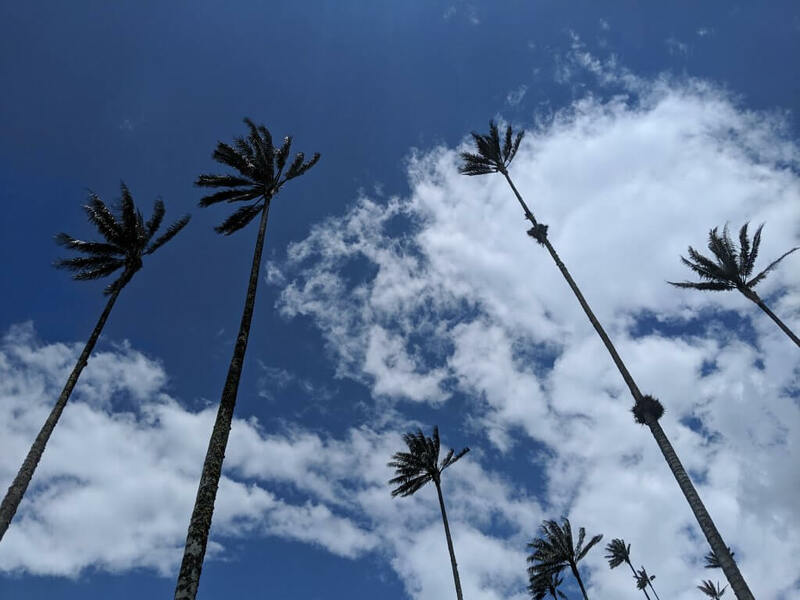 Yet the destination that most enthralled me was a short but steep hike up the Corcora Valley to see the tallest wax palms in the world. These giants tour over 100 feet and pop up Truffula-style like a Dr Seuss kid’s book. I couldn’t help but spy a longer 6-mile trail through the valley and up into the mountains that beckoned my return. Cow-studded trails need some cleaning up in order to attract international hikers. 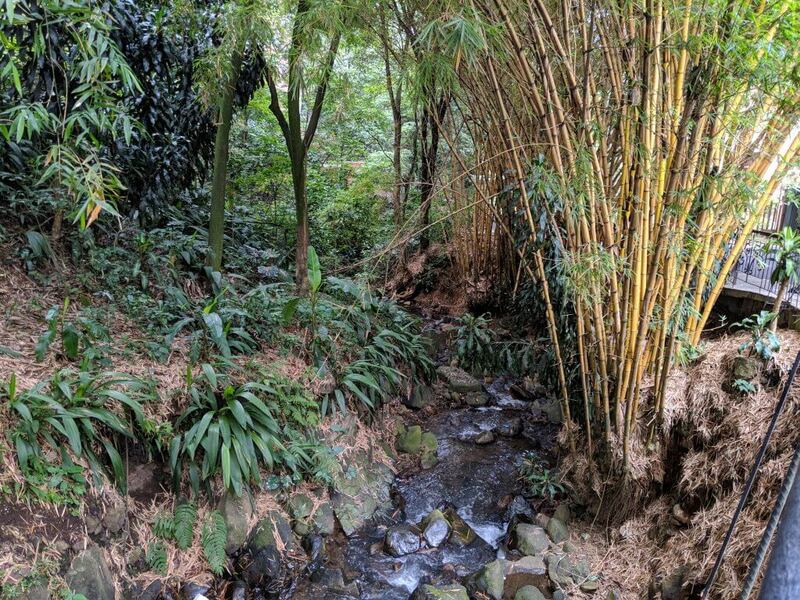 During my final week in Medellin, I squeezed in a three-day/two-night hiking trip through the countryside from Guatapé to San Carlos to San Rafael. Colombia has some work to do to attract an international hiking community. Although there are many fascinating and beautiful destinations for hiking, the trails are ill-maintained and never marked, making a guide necessary and a game of luck as a requirement. The scree-covered, slippery trails workhorse as cattle movers, and hikers who follow behind would enjoy better footings elsewhere. The hiker-based accommodations could use hot water, toilet paper, and soap. Tucked away in the corner of Poblado, find the Castle Museum. Finally, my last few days had me beating a quick trip to two great museums. 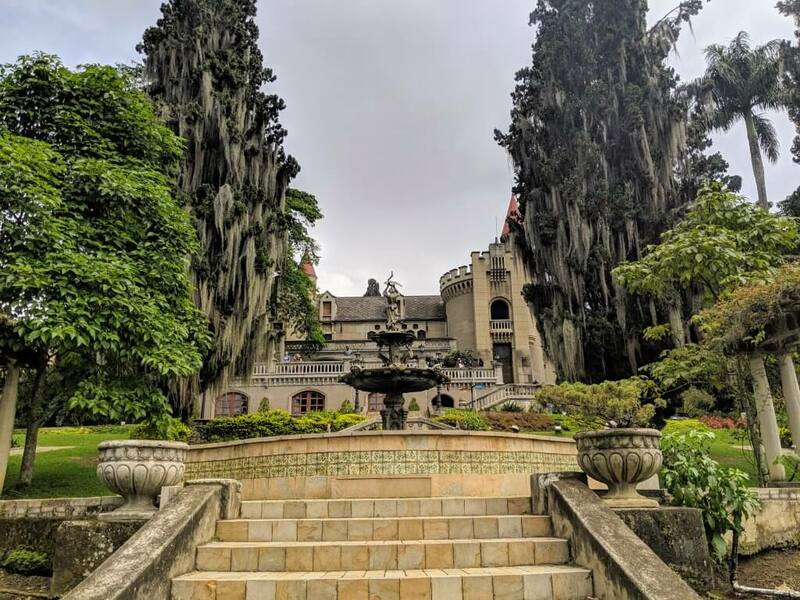 The Museo Castillo, an old castle filled with turn-of-the-century art and furniture, featured a fun temporary exhibit telling the story of bicycle racing through hundreds of restored bikes. The grounds and gardens captured the European’s influence on Medellin. A fitting last piece of art to interpret. 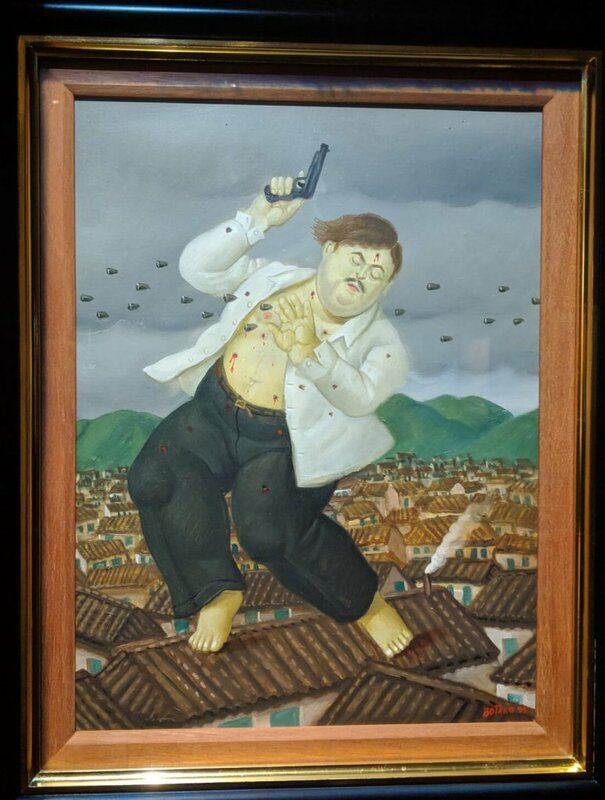 “Pablo Escobar” by Fernando Botero. The shooting and killing of Pablo Escobar: a great finishing touch to a fantastic month embracing Medellin. What will you do in Medellin? Ask me questions on Facebook, tag me in our Instagram photos, or tweet me! I’m @EatWalkLearn everywhere on social media.